This has been a long time coming, and I am glad to finally get it off the ground. 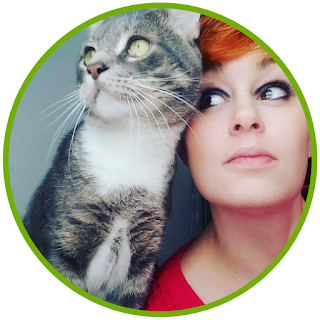 Mastering Your Grimoire is a blog series designed to help witches from beginners to advanced create a grimoire they can be proud of, one full of information, techniques, correspondences, spells, and recipes that can be passed down through the generations. Today, many witches have a Book of Shadows (BOS), not realizing they may need to keep a grimoire as well. "A BOS is a witch's personal book of magic; a diary of magic if you will. It includes records of all magical workings, dreams and their meanings, rituals, etc. If the witch does not also keep a Grimoire, it can also include spells and other magical information needed to perform magic. Its always a good idea to keep records of your magical workings. This will not only help you progress as a witch by seeing your power grow, but will also allow you to see what works and what does not work for you. A Grimoire is like a BOS, but not as personal. It holds information about rituals, spells, potions, and how to prepare magical tools. It also contains lists of correspondences and magical properties of herbs, gemstones, food, colors, etc. Basically, it contains all your magical research. It does not contain personal information or records of magical workings." Personally, I keep two separate books. While I don't plan on having children of my own, I would still like to pass my book on, but not with any of my personal information. Its personal for a reason. A grimoire allows me to catalog all of my knowledge in one place for such occasions as sharing. 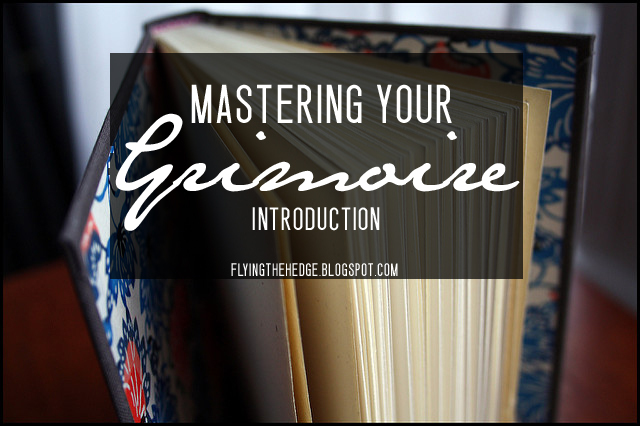 Mastering Your Grimoire is designed to aid you in the creation of your own grimoire. I will be following along in the series as well, showing you how my new grimoire is progressing. One of my goals this year is to complete 12 pages. I know that doesn't seem like many, but when you see what I have been up to, you'll understand why this a perfect number for me. Most posts will have a call to action, something you need to work on over the next couple of weeks/months. The first few posts should come out each week on the weekend. As we progress, however, I will begin tapering the posts. The call to actions will be more intensive, requiring you to read and research or design lengthy pages/sections. 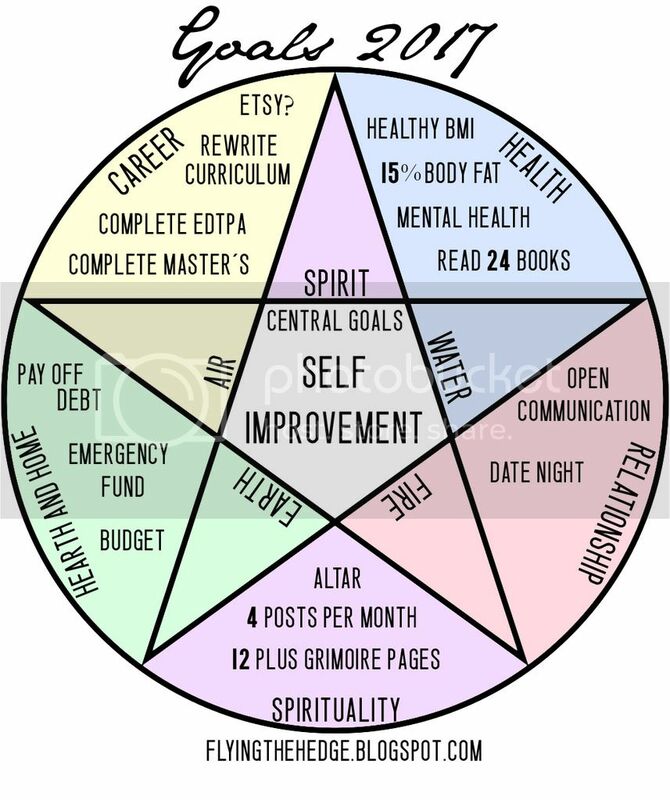 I hope you will join me as I embark on this journey to mastering my grimoire. Oh dearest me. This post is, of course, late again. I seriously need to get a grip on this whole blogging once a week again. Haha! 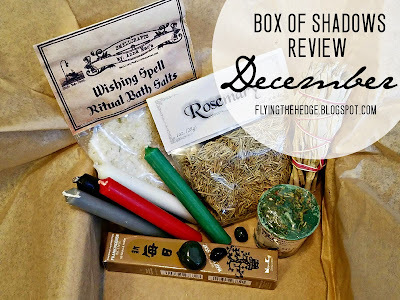 Anyway, without further ado, let me review December's Box Of Shadows. Honestly, I love opening these boxes. It is a little present each month. 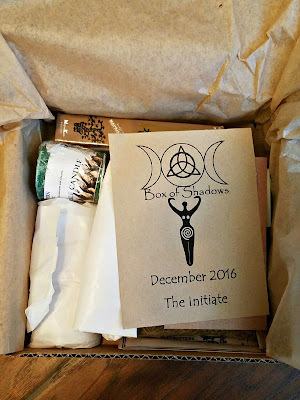 I am going to miss them as I canceled the subscription and am on the lookout for another monthly pagan box to review. I think I found one, but I likely won't be purchasing it until February. The first thing I noticed when I opened this box, however, was the heavenly smell. It smells AMAZING! Next up I noticed a candle similar to the one I received in October for Samhain. This one, however, it for Yule. 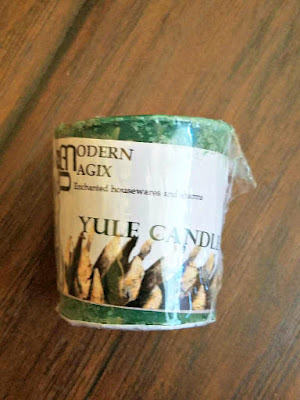 It too smells nice, and I look forward to using it next year in my Yule ritual. Hopefully next year I will have a damn altar! Next up was a box of frankincense incense WITH a holder, which also smell pretty awesome. Frankincense is the most Yule incense you could possibly own. Heck, even the Christians recognize its significance at Christmas. Frankincense, however, is not just for Yule. 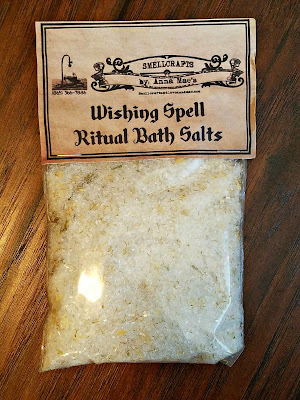 It is also used for healing, relaxation, increasing your connection with the Spirit, and aiding in the elevation of the mind during meditation and visualizations. 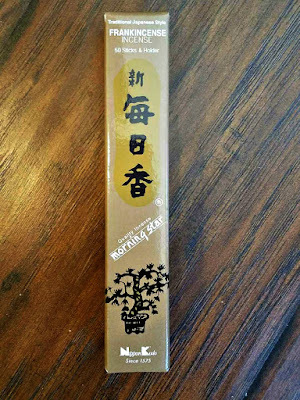 It is also a great incense to use during hedge riding. I'll be using these soon! I then noticed I had received both the monthly crystal and monthly herb, a very pleasant surprise indeed because normally you receive one or the other. This month's herb was rosemary, used for protection, purification, healing, and love, and the gemstone was bloodstone, used for health, protection, good luck, success, and courage. This is a must have stone coming into the new year! 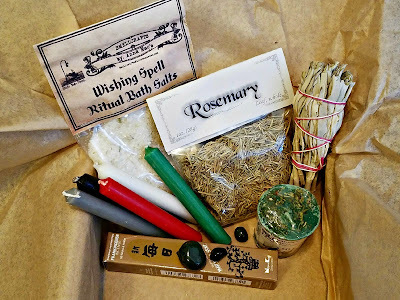 Of course, I also received some sage and some candles in red, green, white, black, and gray. Overall I was very pleased with this box! I cannot wait to sign up for a new subscription service, but I have a feeling I will likely be returning to this one day. Just depends on what I review in the future! The box is consistent. 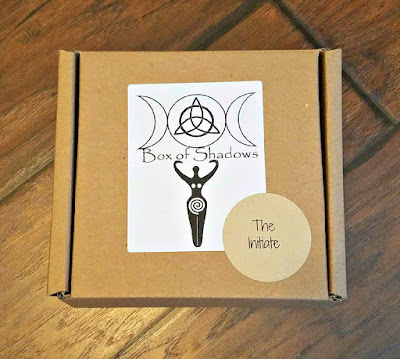 It always comes with candles, sage, crystal/herb, and some other themed items centered around the sabbats or full moon. The item quality is great. I felt that I got my money's worth. I LOVED that this subscription box offers subscription tiers, making it more affordable than other subscription boxes. While I loved the consistency, this is not something I need every month. I was quickly overwhelmed with candles and sage. This box sells out quickly, so you have to be on it to sign up and secure a spot. The waiting list, however, is not very long. It opens up month to month. The information sheet was not very informative. There is no mention as to where the items came from, what to use them for, or why they were included. I would like to know what businesses I am supporting and the purpose of each item, especially because this is supposed to be for beginners. Even though I have been practicing half of my life, I don't know everything and I love learning new things.